Chrisitine lives with her husband and two precious daughters in the foothills of the beautiful Ozark Mountains in her home state of Arkansas. Her greatest earthly joy is her family and, aside from doing God’s will, spending time with them is her top priority. She recently took a break from writing romance to pen a Christmas story with a twist. Her Mom Lit novella, My True Love Gave to Me, is part of a 2 in 1 anthology from Barbour entitled All Jingled Out. It’s also included in Simply Christmas, a 4 in 1 Barbour anthology. One of my holiday highlights was seeing Simply Christmas at Sam’s Club a few weeks before Christmas. Actress Crytal McCord gave up the closeness of her big family in order to make a name for herself on the New York City stage. But when life in the Big Apple turns sour, she follows a country road back to her parents Arkansas ranch. My Review: I have to admit that I am not usually that much of a romance fan, but this book grabbed me and I tore through it in one night. The characters are beautifully written, the story is wonderful, and I am now a Chrisitne Lynxwiler fan. My favorite part of this book is the wonderful family the main character comes from. She has a wonderful bond with her parents and siblings. The family had me wishing they would adopt me! I highly recommend this heart warming novel and am eagerly anticipating reading more from this very talented author! You made my day, Vanessa!! 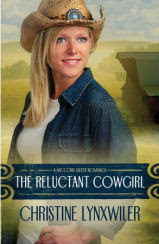 Thank you for liking The Reluctant Cowgirl and the McCord family. I'm loving getting to know them even better as I write Cowgirl at Heart (Elyse's story.) It's amazing how attached we get to characters. Thanks again for blogging about the book and saying such sweet things! :) I love your blog.